The D-760 night scope and the D-790 night scope are the king of kings of long range night vision rifle scopes. 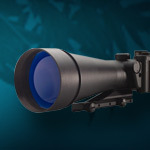 This powerful 6x magnification scope can reach out farther and in darker conditions than any other model on the market. The popularity of the D760 Night Vision Scopes is a result of it's dominating effectiveness, with almost a cult following among serious night vision users. From Law Enforcement Officers to Hog Hunters the D-760 night vision Scope is the top choice for serious long distance night shooters, especially in Gen 3 night scopes. The outstanding low light performance is matched with super toughness in almost any environment as well as recoil resistance up to and including 50 caliber BMG rifles. NightVision4Less is proud to offer 10 different models of Gladius 760 scopes as you will see below. For increased versatility and performance we particularly like the hand select models with Manual Gain Control. And now introducing, the new D-790 Night vision Rifle Scope. This powerful 6x magnification scope is equipped with high performance lenses that are up to 30% better than the D-760 lenses. The D790 night Scope also has more ergonomic housing and controls. If you would like help choosing all of our different models please feel free to call us at 1-800-771-6845. We would be happy to guide you through the different choices now including the Magnus 790 scope.